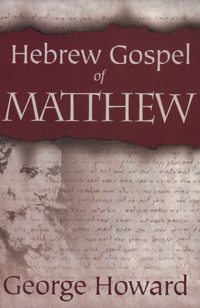 For centuries the Jewish community in Europe possessed a copy of Matthew in the Hebrew language. The Jews' use of this document during the Middle Ages is imperfectly known. Occasionally excerpts from it appeared in polemical writings against Christianity. By the end of the fourteenth century, however, the entire Hebrew Gospel appeared in the polemical treatise Even Bonham, by the Spanish writer Shem-Tob ben -Isaac ben- Shaprut. An important thrust to this volume is to establish that the Hebrew Matthew of the Even Bohan predates the fourteenth century. It shares many readings with ancient Christian writings, some of which were lost in antiquity only to reappear in modern times. These included Codex Sinaiticus, the Old Syriac version, the Coptic Gospel of Thomas, and a host of others. It also analyzes the language, artistic touches, and theology of the Hebrew Gospel.